This particular scene shows Tom and Jerry accompanying the Misses Trifle to the Exhibition at the Royal Academy. The early 1800s saw a massive rise in the number of visitors to the Royal Academy, with more than 67,000 people viewing the art every year. They held an Annual Exhibition, also known as the Summer Exhibition, or, in this case simply “The Exhibition” which was the most prestigious showcase of British art. 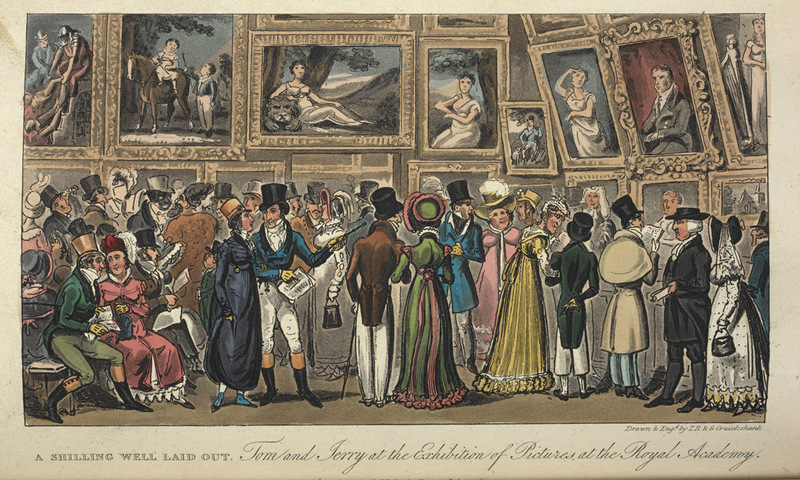 As can be seen in this etching featuring Tom and Jerry, the crowd of upper class visitors indicates that it was also a highlight of the London social calendar. 1. The Gentle Author. “Tom and Jerry’s Life in London.” The British Museum. May 15, 2014. https://www.bl.uk/romantics-and-victorians/articles/tom-and-jerry-life-in-london.